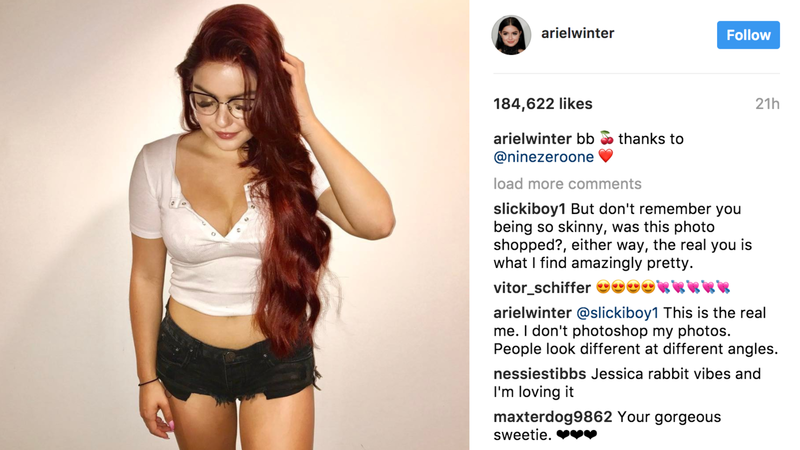 If you weren’t aware by now, Ariel Winter knows how to school haters on Instragram, and this latest example of the actor telling it how it is is no exception. Of course, we totally respect Ariel Winter for living her best and most true life, and the Modern Family star is always inspiring us. Whether it’s nailing what mean trolls online should do, speaking about shaming school girls for their dress code, or responding to being bullied by people on Instagram, the 19-year-old is also quick to put a stop to anyone who tells her how she should live her life, and we totally love her for it. That’s why it should come as no surprise that Ariel Winter is at it again. As is her wont, the star recently shared a pic on Instagram of herself wearing a casual and low key outfit. The pic sees Ariel with her new Little Mermaid-like hair as she rocks some short-shorts, a buttoned top, and some rather fab glasses. Also, if you look close enough you’ll seems that Ms. Winter’s eyelashes are pretty spectacular, too. While that should be enough, one commenter on Instagram questioned the authenticity of the picture. They asked whether it had been digitally altered. While Ariel has previously said that she doesn’t really pay attention to the comments on her Insta, the actor decided that she would respond in this particular instance. While it might not seem like this comment is that bad, it’s not really okay to comment on someone’s body, and accusations of photoshopping can be pretty hurtful. However, we totally love how calm and matter-of-fact Ariel Winter is when it comes to addressing any accusations. As she says, people do look different from different angles, and that’s totally okay. Also, if she had photoshopped her picture that’s also her prerogative as it’s her Instagram, and her picture. Essentially, just keep doing you Ariel, ’cause you rule!